April 13, 2015 is “Muslim Advocacy Day” on Capitol Hill. The U.S. Council of Muslim Organizations (USCMO) will spend Monday and Tuesday of next week on Capitol Hill advocating their position as the first national Muslim political party. Formed in June of 2014, the USCMO is made up entirely of Muslim Brotherhood/Hamas organizations – but that is redundant since Hamas is an inherent part of the Muslim Brotherhood. Hamas is the Muslim Brotherhood in Palestine. Reminder: Hamas is a designated Foreign Terrorist Organization. No surprise – the Muslims who will “represent” the Muslim community in our nation’s capitol actually represent jihadi (“Terrorist”) organizations. This is another attempt by our enemies to put a tuxedo on a turd and call it dessert. Let us pray our leaders don’t line up to eat. The brazenness of this effort by the enemy with no response from our leaders is what should concern American citizens. Can you find the guy who is NOT Hamas in this photo? Hint: There isn’t one. Facts and evidence apparently have little weight these days, but lets lay them out anyway. USCMO is made up of the Muslim American Society (MAS), Islamic Circle of North American (ICNA), Council on American-Islamic Relations (CAIR), The Mosque Cares (Ministry of Imam W. Deen Mohammed), American Muslims for Palestine (AMP), Muslim Legal Fund of America (MLFA), Muslim Ummah of North America (MUNA), Muslim Alliance in North America (MANA), American Muslim Alliance (AMA) and The Mosque Foundation (Chicago). 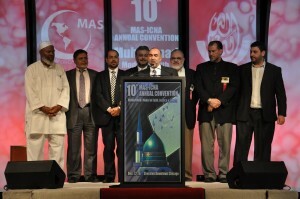 MAS was identified by its leaders and the U.S. government (US v Sabri Benkhala) as a Muslim Brotherhood organization. ICNA was identified as a part of the MB’s Movement in North America by evidence in the US v Holy Land Foundation (HLF) trial in Dallas, Texas in 2008 – the largest terrorism financing and Hamas trial ever successfully prosecuted in U.S. history. The ICNA/MAS Training Guide calls on its adherents to establish an Islamic State under Sharia and “wage war” to do so (page 117/321). CAIR was identified by evidence in the US v HLF trial as being the 4th organization created by the U.S. Palestine Committee (Hamas) to be a front for Hamas here. The Federal Judge and the Appellate Panel agreed. The Mosque Cares is a part of Imam W. Deen Mohammed’s jihadi network. American Muslims for Palestine (AMP) is one of the latest fronts created by Hamas in the U.S. led by Muslim Brother Dr. Hatem Bazyan. The Board of Muslim Legal Fund of America (MLFA) is littered with Hamas leaders including…all of them. Dr. Jess Ghannam, Dr. Hatem Bazian (name familiar? ), Tarek Alkadri, Mouffa Nahhas, and Khalil Meek. Alkadri, Nahhas, and Meek all openly served in various positions for Hamas in the U.S. (dba “CAIR”). MUNA is another well-known MB organization which is a part of the American Muslim Task Force, yet another conglomerate of MB/Hamas organizations whose leaders are made up of the usual suspects. AMA can be summed up by a quote from the protege of the Muslim Brotherhood’s Founder Hassan al Banna quoted on AMA’s website: “Membership in AMA is not optional but mandatory for every Muslim.” Dr. Maher Hathout, Muslim Public Affairs Council (MPAC) – also an MB organization. Decades ago, Hathout and his brother spent time in Egyptian jail for being members of the Muslim Brotherhood. The Chairman of AMA is Dr. Agha Saeed. You guessed it – he is a Hamas leader. The Mosque Foundation in Chicago is a Hamas front. Its leader Sheik Kifah Mustapha was a named unindicted co-conspirator in the US v HLF trial (largest Hamas trial in American history) because he raised money for Hamas. So, next Monday, Capitol Hill will be swarmed by Hamas jihadis in suits. These men should be in jail, not on Capitol Hill. UTT encourages all readers to contact their Senators and Representatives and ask them why they are allowing terrorists on Capitol Hill. First, let me say to you sir that you are a true American patriot! Thank you for all you have done, and continue to do, to protect and defend the Constitution of our great nation! As you have so clearly articulated, I am very concerned, alarmed, and angered that the Islamic ‘enemies of the state’ have been allowed to ‘breach deep into the wire’ by our so-called ‘political elites’ who are continuing to sell out their own nation at an ever increasing rate! Food for thought… outlaw Islam in America (it is NOT a “religion,” and Muslims are NOT in America to assimilate; rather, they are here to dominate and replace our Constitution with sharia law…there is no such thing as a “moderate” Muslim); stop ALL Muslim entry/immigration into America; shut down ALL Muslim Brotherhood front groups (arrest/charge with sedition); deport ALL Muslims (after first revoking citizenship and/or legal permanent residence status) from American soil to any of the 56 member Islamic states of the Organization of Islamic Cooperation (OIC); and tear down all mosques in America. Finally, arrest, charge with sedition and treason any person (especially those in political positions of trust) for facilitating, aiding, and abetting the Islamic enemies of our great nation. When are you going to allow comments/replies to be shown openly in response to your articles? I have commented twice now and have not heard back from you or seen my comments posted. In fact, every single article that you have posted has 0 comments! ?